In today’s world of nearly ubiquitous HD home entertainment systems, cinema exhibitors have realised that they must make going out to the movies a true event for their patrons. 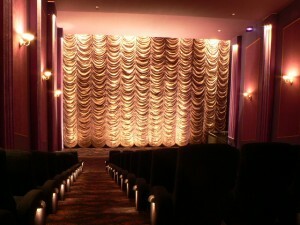 Nothing does more to create a real and memorable cinema experience than an impressive cinema main curtain. At Specialty Cinema, we can design, manufacture and install pretty much any kind of cinema main curtain that you could require. Please just give us a call to talk through the options.